The problem with Cohen's characters is that they are more suited to a shorter, sketch format and feel strained when stretched over feature length. "Borat" was something akin to lightning in a bottle, and somehow sustained its comedic brilliance for its entire length, employing a brand of social satire that has been mostly missing from his subsequent features. 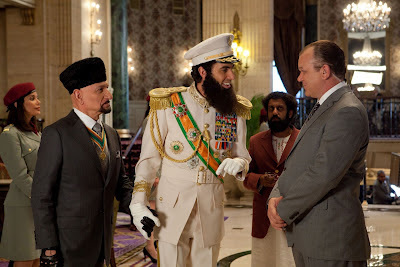 "The Dictator" comments somewhat on current events, but in a much more heavy-handed way. That is not to say that it doesn't feature moments of comic inspiration, but it also drags due to its loose inclusion of a more typical plot structure. The pranks Cohen would pull on unsuspecting citizens were always a highlight of his films, and they seem sorely missing here.